The sound of running water soothes frayed nerves. For this reason, many choose to add a solar waterfall to their Growing Dome kit. The ambiance and sense of serenity it creates is so invaluable. The solar powered waterfall provides aeration for the above ground pond (learn more about this unique feature included in your Growing Dome kit), adding oxygen to the water for the fish. The circulation also provides a beneficial environment for snails and aquatic plants in the pond and helps to slow down algae formation. This mini ecosystem is another way to enjoy growing different types of plants and fish within the greenhouse. The pump is powered by a solar panel on the roof of the Growing Dome that is provided with this upgrade. The waterfall only runs when the sun is shining as it is directly wired to a solar panel that runs the submerged pump. 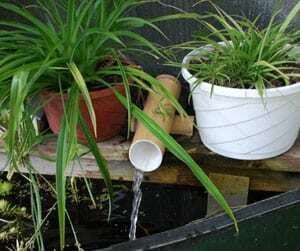 The Solar Powered Waterfall upgrade consists of a pump, a decorative bamboo spout, a solar panel and connecting hardware. Watch this video for more information on the pond and to see and hear footage of one of our waterfalls!